Pasco County Farm Bureau has deep roots in Florida’s agriculture industry and is very involved in promoting agriculture. Sponsoring activities and trophies for the county fair as well as partnering with local businesses to put on the annual Spring Shoot are just a few examples. 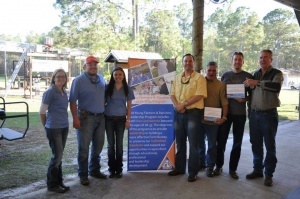 Many of the Pasco County members are also associated with organizations such as Florida Cattlemen’s Association, Florida Citrus Packers, Florida Fruit and Vegetable Association and Florida FFA Foundation. Pasco County Farm Bureau is dedicated to keeping the community, especially the youth, informed about local agriculture through ag awareness education. One event that the county participates in is Agritunity, which is a multi-county event that reaches over 1,000 participants. The Pasco County Young Farmers and Ranchers group participated in Ag Literacy Day where they visited schools and read books educating children on the importance of agriculture. Youth are encouraged to participate in local speech contests to get involved and research specific topics related to agriculture even if they are not active in FFA or 4-H.